Summary: "In fifty poems Christine Heppermann places fairy tales side by side with the modern teenage girl. Powerful and provocative, deadly funny and deadly serious, this collection is one to read, to share, to treasure, and to come back to again and again." where bad things also happen? just as easily in the suburbs. No need for a bunch of trees. You can lose your way anywhere. I dare you to tell me that poem didn't give you chills. 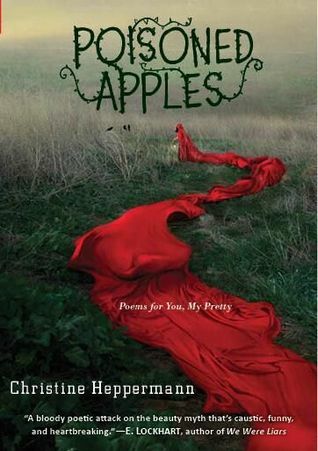 These poems are a mash-up of fairy tales and the issues modern girls face daily. It writes to you, assuming you are the princess, the hero, and the Big Bad Wolf rolled into one. Because girls are play more than one part, and are more than one roll. I found it to be charming, funny, sad, shocking, and utterly captivating. And short! Did I mention how short it is? I think I read the whole novel in a half an hour. And I wished there was more. I loved every word, and would wholeheartedly recommend it to everyone. READ IT! Bottom Line: I absolutely loved this book, and plan on purchasing a copy for my own library. Insightful and powerful and very accessible, I'd recommend this to pretty much everyone. Don't let the word "poetry" scare you, this is one you won't want to miss. Interesting! I'll have to check this out! Do! It's well worth the half hour it takes to get through. In fact, I read most of the poems twice. I gave this to my daughter for Christmas and read a few of the poems before she took the book home with her. They were so beautiful. What a great gift! Glad you got to read a few, they really are stunning.